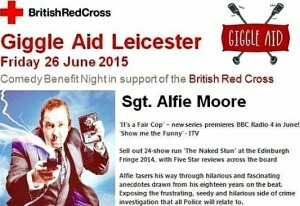 Alfie Moore will be saying ‘allo ‘allo ‘allo to the packed audience at Giggle Aid Leicester on Friday 26th June. It promises to be an evening of top-class comedy with top notch acts from across the comedy circuit happy to donate their time to raise funds for the British Red Cross. The show will once again be compered by the incomparable Sully O’Sullivan and, in addition to Alfie, the line-up for the evening includes President Obonjo, Ben Briggs, Rob Coleman and Chris Purchase. 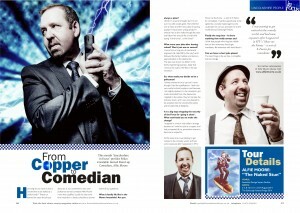 Go along and have a good giggle and help an extremely good cause. The Red Cross helps millions of people in the UK and around the world to prepare for, respond to and recover from emergencies, disasters and conflicts. Alfie is delighted to be a guest of the legendary Libby Purves on BBC Radio 4’s Midweek programme at 9am on Wednesday 17th June. The show is a fabulous smorgasbord of lively conversation. The other guests are Michael Volpe, founder and general manager of Opera Holland Park, Lucy Saxon, a young author of fantasy adventure novels, who started writing as a way of coping with the debilitating condition ME and sculptor Richard Hudson. Tune in and enjoy – and if you miss the morning show it’s repeated on Wednesday 17th at 9.30pm or can be found on the BBC iPlayer. 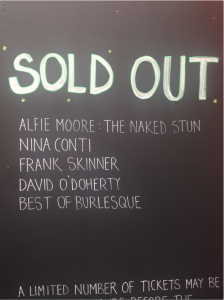 Listen to Alfie’s exclusive interview, talking about his Edinburgh Show ‘The Naked Stun’, with Megan McGuire from Fresh Air Radio. Former Skegness copper Alfie talks to Lincolnshire in Focus about his life before becoming a comedian and what made him decide to take up comedy. Don’t worry – they’re not in the show! P.S. These two jokes also made it into the Mirror’s Top 100 jokes from the Edinburgh Festival – 19th August 2014. This time Colin and his neck brace made it to number two….. The sell out run continues and Assembly George Square have now added a further extra show to the run on Sunday 24th August. 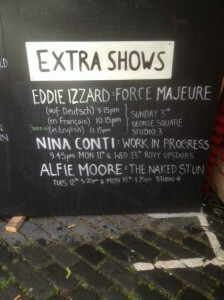 The extra performance will be at 1.20pm in George Square Studio 5. Alfie said “I’m having a fabulous time here in Edinburgh and I’m really pleased that so many people are enjoying ‘The Naked Stun’ that we’ve added our third extra show”. He added “Everyone is working so hard behind the scenes to make this happen and I’m very grateful to the Assembly George Square management and of course the lovely team from Mick Perrin Worldwide. Everything about the Assembly venue and staff is just perfect in terms of organisation, accessibility, comfort and ambience – both for performers and audiences alike”. Proceed as quickly as possible to the Box Office and BOOK TICKETS before they are all sold out. Six new episodes of ‘It’s a Fair Cop’ have been ordered – to air in the summer of next year – following the success of the three-part comedy series last month. Each episode uses a scenario based on a real-life police case, with the studio audience asked to decide how they would have acted if they were a police officer in the circumstances. 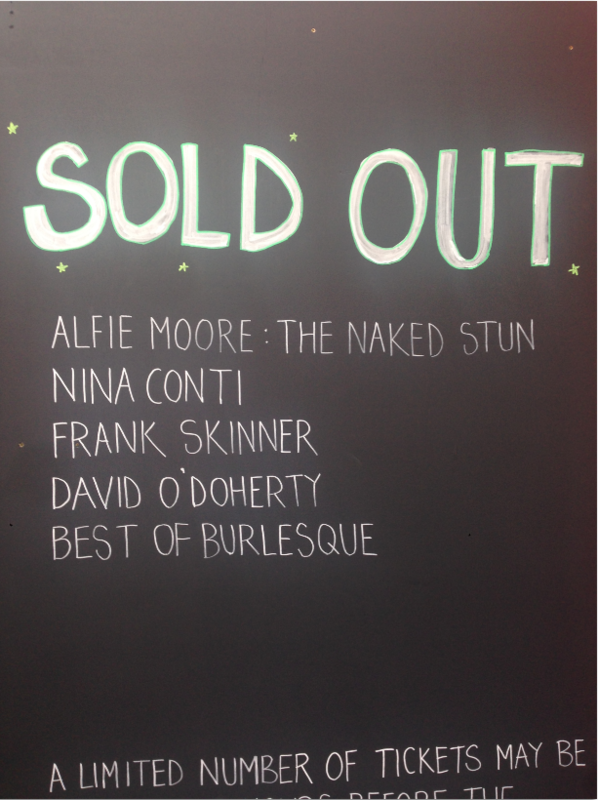 The Festival officially opens tomorrow but the Naked Stun has already had it’s first sell-out on a preview day. When the sell-out was confirmed Alfie said “I’m absolutely chuffed, and I really appreciate the support from everyone who’s bought tickets. It’s a fabulous performance space (even air-conditioned – a rare and very welcome thing in Edinburgh). 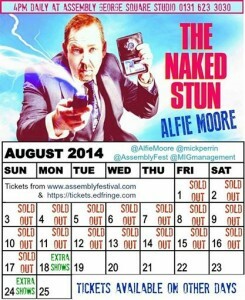 Alfie is playing at the Assembly George Square (studio 4) at 4pm every afternoon until 25th August. 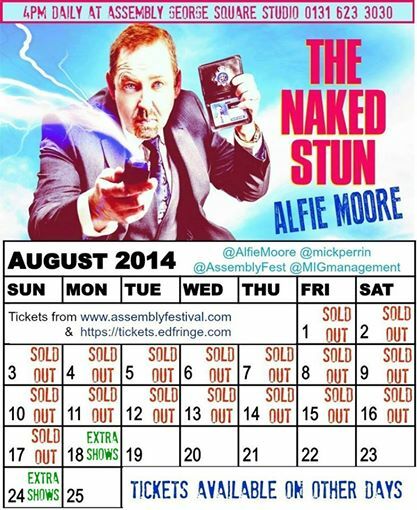 BOOK YOUR TICKETS before the shows all sell out………….